Cheap low-cost non-stop flights Barcelona to Boston €165! Cheap flights from Amsterdam to Cuba, Peru or countries of Central America from €377! Another low-cost solution from Spain to USA based on promotional sale of Iberia (LEVEL) this time super cheap non-stop flights from Barcelona to Boston. (You can also use service of this carrier to California (Los Angeles or San Francisco). Right now Iberia / LEVEL have released another set of discounted flights for next travel period. Cheap low-cost non-stop flights Barcelona to Boston are now available already for €165. This is including all taxes however you need to purchase any additional service extra. (in-flight meals, seat selection, checked bag etc.). You are modest traveler and need the cheapest solution to U.S. East Coast this is awesome low-cost solution with low-cost airline LEVEL. (At this moment flights are based on service of Iberia). To benefit from this LEVEL / Iberia promotion you need to look for limited availability in November or from 9th of January and 26th of March 2020. Max stay 12 months. Each travel date allows only very limited discounted seats so if you want to book the cheapest deal with Iberia better hurry up with your booking. Below you will find our booking and travel date samples. (This time our deal is based in direct booking with carrier where you can easily compare all the cheapest flights). If you book this cheap low-cost flight to Boston you might also need some affordable accommodation. We recommend service of leading booking sites such as Booking.com or Hotels.com. Booking sample of LEVEL / Iberia promotion offering very cheap low-cost non-stop flights Barcelona to Boston €165! Date of your outbound flight from Spain to the United States would be on 12th of November. Inbound flight from North America back to Europe (direct service) on 19th of November 2019. 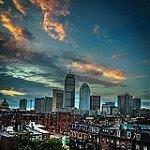 Take the advantage of latest Iberia promotion and book super cheap flights to Boston!